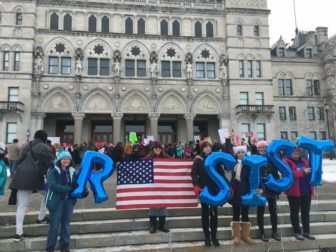 Capitol Police said the crowd at the Women’s March in Hartford reached 10,000. 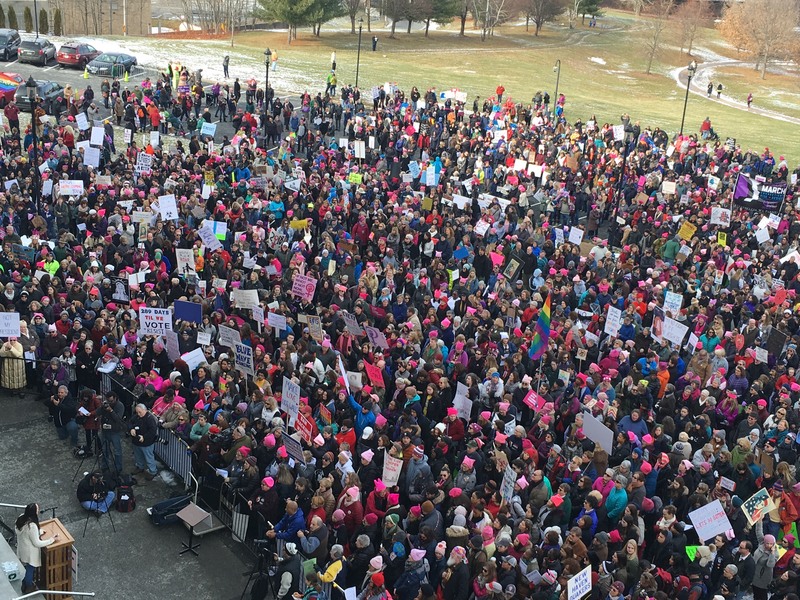 A year after thousands of Connecticut marchers took to the streets wearing pink hats and carrying homemade signs of resistance in the first Women’s March in Hartford, residents returned Saturday to again issue calls for action — this time to empower women at the ballot box. A crowd police estimated at 10,000 gathered outside the State Capitol as marchers around the country protested President Donald Trump’s policies, and highlighted the #MeToo movement against sexual assault and harassment. This year’s event was focused on motivating women to vote and run for positions of power, rally organizers said. 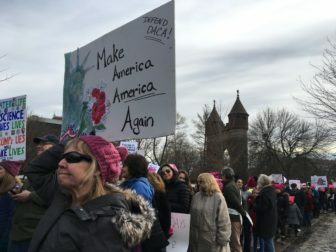 Chants of “This is what democracy looks like,” “Love, not hate, makes America great,” and “Hurry up, Mueller” erupted as marchers clad in pink hats and bearing protest signs snaked around Bushnell Park to the north steps of the Capitol. Val Payne, 51, of Manchester, wore black in support of the #MeToo movement and said she thinks the Hartford march shows where the country is and that people want to see a difference. Elected officials and activists took turns addressing the crowd to denounce the Trump administration’s policies and call on women to take a stand. Other speakers recited their own poetry and sang songs. Lt. Gov. Nancy Wyman drew enthusiastic cheers as she called for inclusivity and a continued fight for justice and equality. “We want this country to be as strong as possible — that all people are welcome here from all over, and those that are living here should have the right of all people no matter where you pray, no matter what you look like, no matter who you love,” Wyman said. 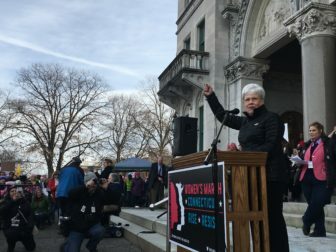 State Sen. Beth Bye, D-West Hartford, told rallygoers she was sick and tired of a lack of women in the Connecticut legislature and urged more parity. Lt. Gov. Nancy Wyman addresses the crowd. The event also touched on the housing issues facing the roughly 40 displaced Puerto Rican families in Hartford who were housed under the Federal Emergency Management Agency’s Transitional Sheltering Assistance program. That program has allowed evacuees whose homes were destroyed by Hurricane Maria to stay in subsidized hotels, but the agency reversed its approval for those families earlier this week. Hartford City Councilwoman Wildaliz Bermudez told the crowd to turn around and look at the Red Roof Inn across the park, where many of the evacuees were staying. Protesters of all ages from across the state came to the event, which drew numbers equal to last year’s rally on a January day that had warmed from frigid temperatures earlier in the week. Kevin Keegan, 31, said he went to the national Women’s March in Washington, D.C., last year because it was necessary to go to the capital and make a statement. “I’m here because the current discourse at the highest level of our government is leading to a less inclusive society, and it seems to be making people more afraid of getting involved, and that’s not necessarily going to lead to a functioning democracy,” Keegan said. Maggie Dowling, an 18-year-old high school student from Stonington, also attended the event in Hartford last year. Dowling said she is mainly concerned about reproductive rights and Planned Parenthood. Kathy Miller of Bethlehem marches with her sign. “I’m definitely pro-choice … he doesn’t want to fund them because of that, even though that’s a really small portion of what they actually do,” Dowling said. Other rallygoers mentioned immigration as a reason to take action and attend the event. Miller said she is upset that so many people didn’t take the time to vote in the 2016 election. “I’m very upset about the environment; I’m very upset about civil rights; I’m very upset about the undoing of so many things in place that make this country work as a democracy,” Miller said.